Extensive visitor infrastructure due I'm sure to pleasure boat travel. WEATHER: High low-mid 70;s, less humid. . 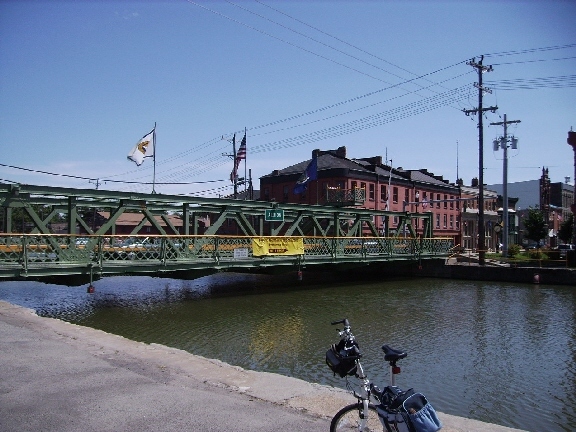 The easiest way to get from downtown Lockport to the bike path going east is to head east a block on Main Street from Pine and then bear left on Market Street until you can cross the canal to the path. We missed Market Street but with help found the path a few blocks further east. Ironically, here was mile marker 0. The mile markers continued only until Albion; and that was the last of any consistent mile markers. It must be a county thing. 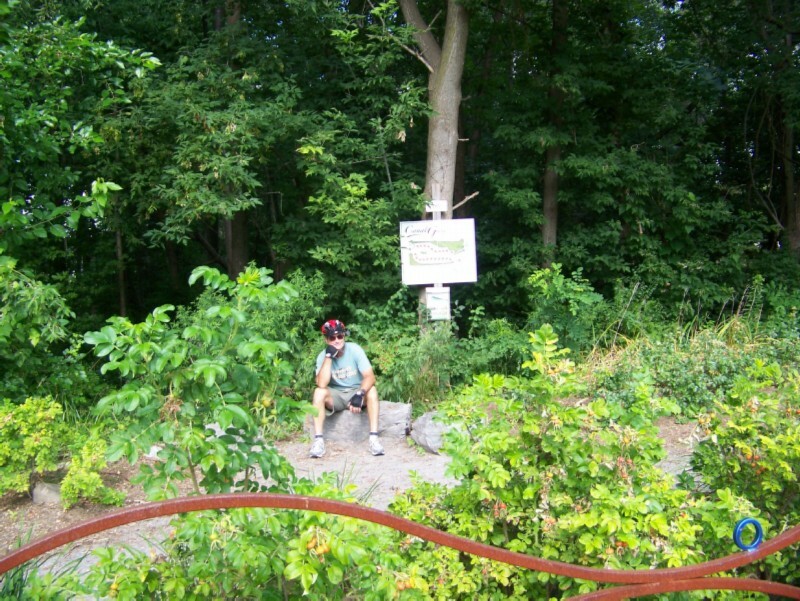 The first few blocks of the trail was rough with bike tire ruts and horses hooves. 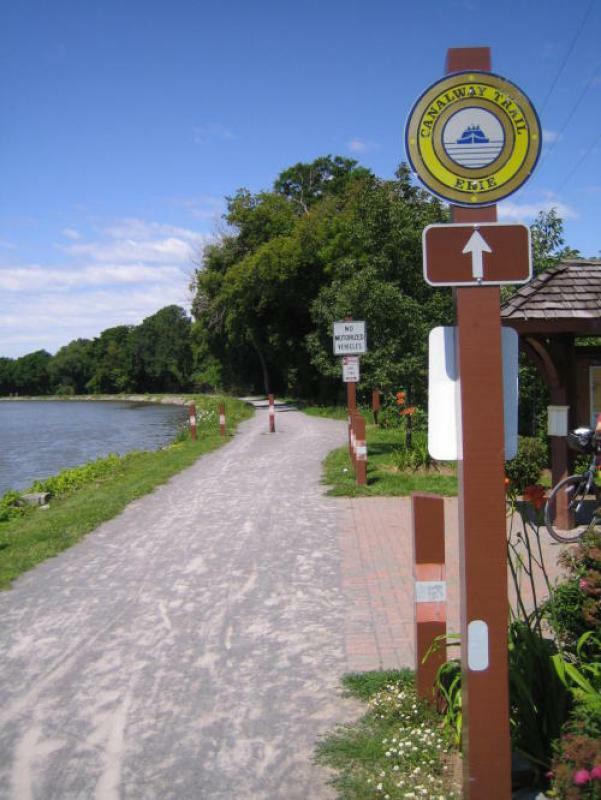 But soon it became as smooth as a lot of roads and equivalent to the Katy Trail and the Wisconsin trails. At the first rest stop, I managed to sit on a fishing lure with 2 sets of 4 barbs each. A second operation was needed to extract the hooks from my bike shorts. A stately mansion between Lockport and Gasport. Marina at Middleport. 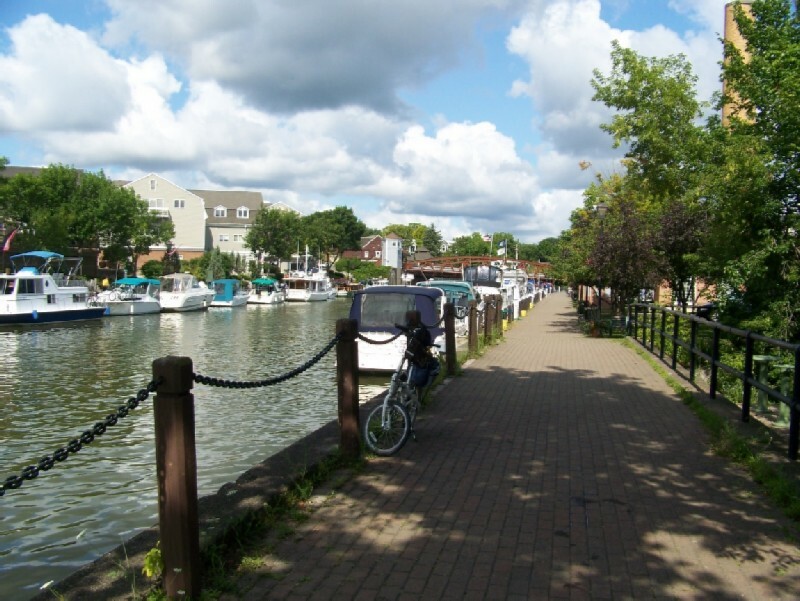 Marinas were a common feature along this segment of the tour. Lift bridge at Middleport. You always knew where you were on this segment because of the sign on the bridges. Here we met our first through rider. He was from Vancouver, WA, and was biking from Anacortees, WA, to Bar Harbor, ME. Guillotine between Middleport and Medina. 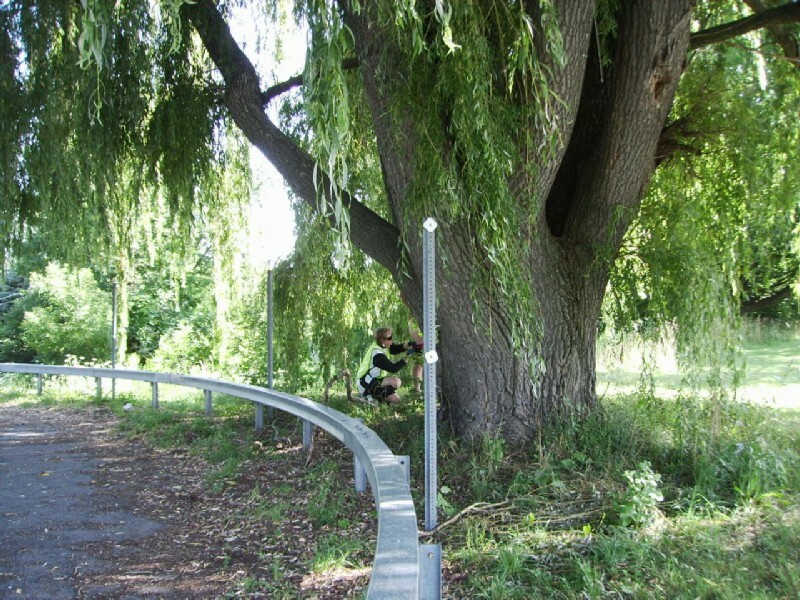 These structures have something to do with controlling the flow or amount of water in the canal. I never found out where the water in the canal comes from. 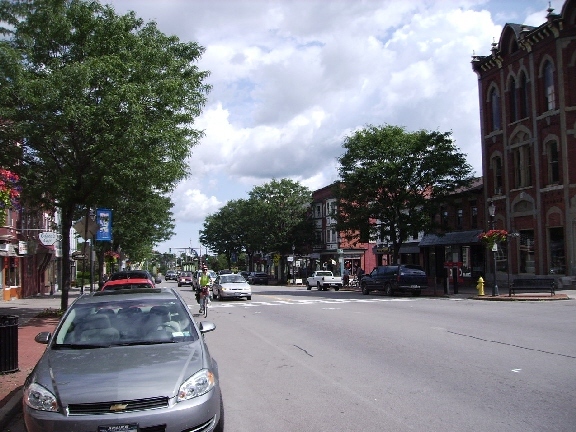 Medina Main Street. 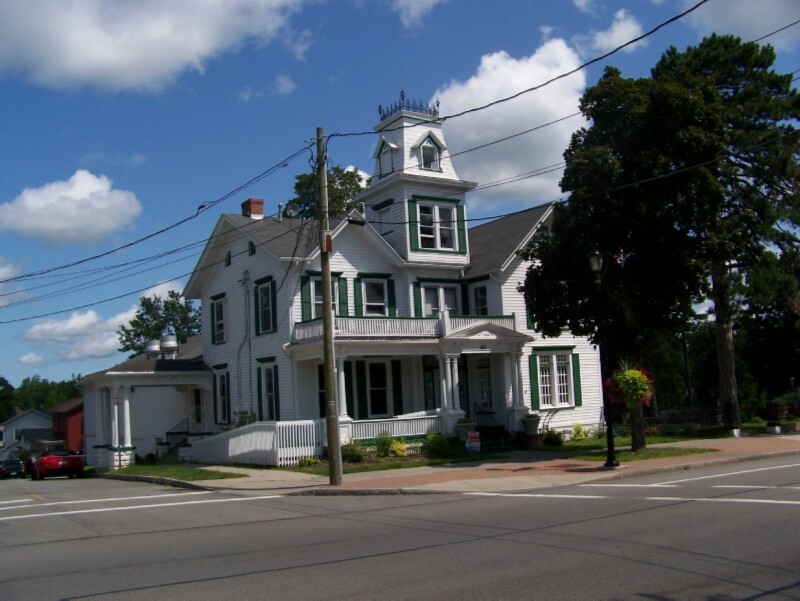 Towns along the Erie Canal Heritage Trail generally had interesting 19th century buildings in good shape both in downtown and residential areas. 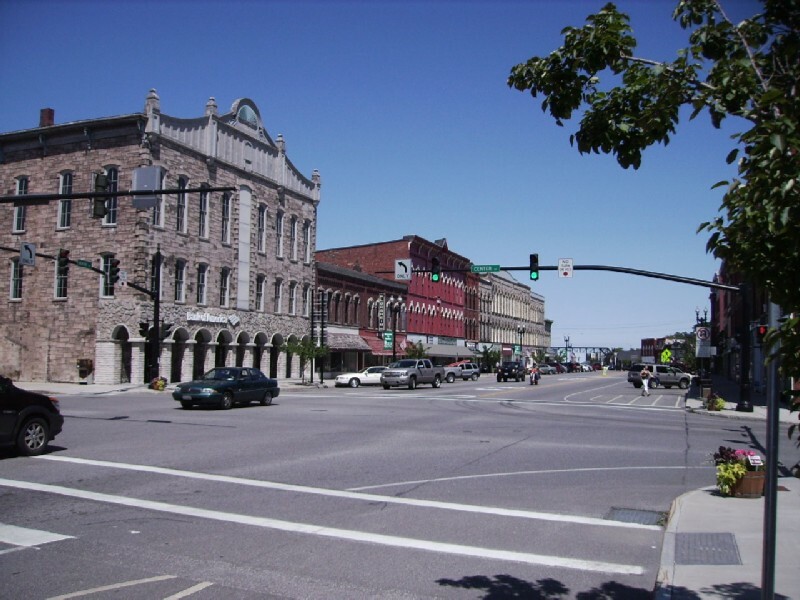 They didn't have that semi-abandoned look that many small towns have. 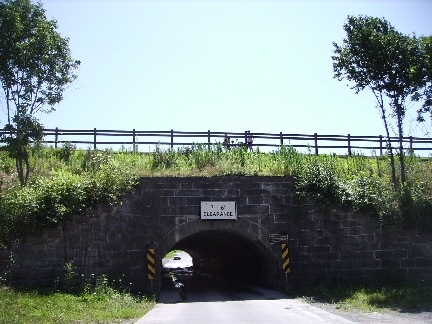 The famous culvert under the canal just east of Medina. 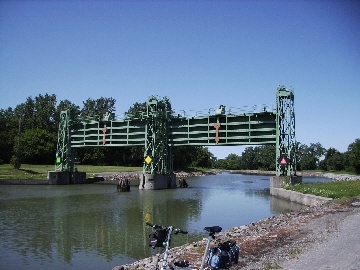 Low level lift bridge into Albion. 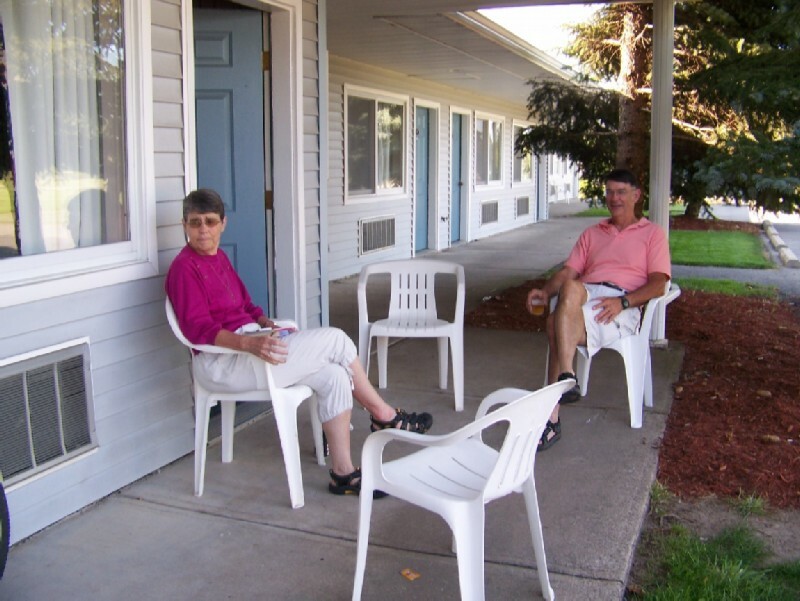 Relaxing at Dollinger's Motor Inn, not to be confused with Dollinger's Motel. This was a very nice "mom & pop". As seemed to be the norm across Upstate NY, it didn't provide a continental breakfast, However, there were two supermarkets and a package store right next door. 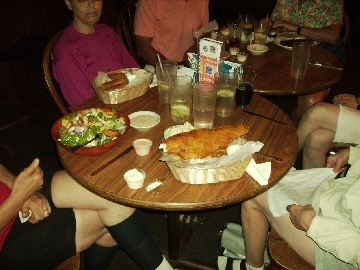 Haddock at Wiggly & Jiggly's English Pub in Medina. Haddock, my favorite fish, was featured on menus the entire length of the canal. 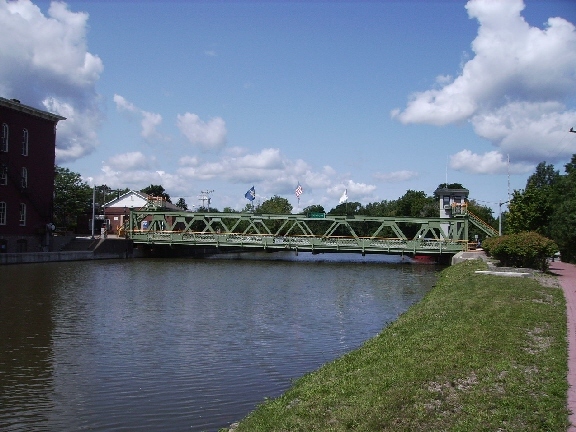 Lift bridge at Holley under repair, with the attractive village park in the background to the left. Because there was no continental breakfast, the plan was to look for a "spit & whittle" cafe in Holley, the first town along the way. 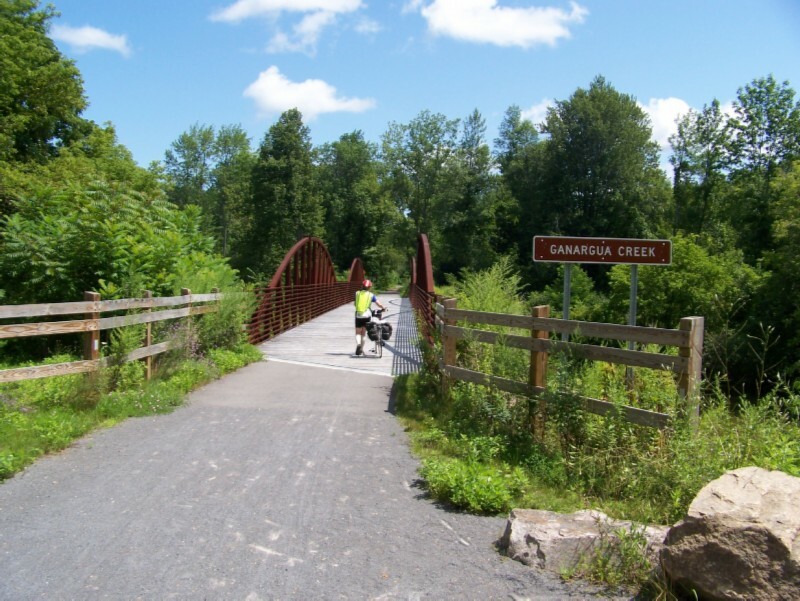 Unfortunately, the bridge was impassable for vehicles; and no one wanted to walk it into town. So we made due with emergency rations. Impromptu breakfast at Holley. 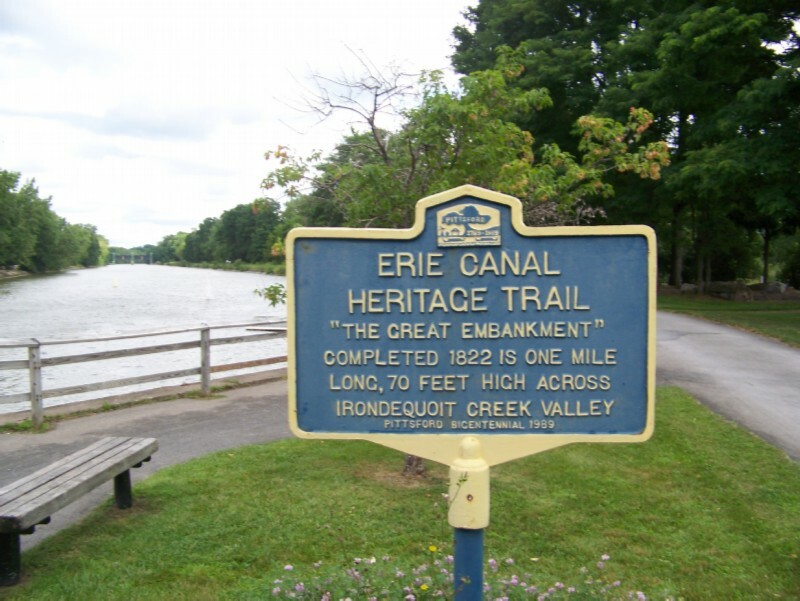 The sign boards found at many trail heads contained interesting history about the canal. However, the maps (other side) were very imprecise and not very helpful for navigating or determining where you were. Here we met our second through rider. He was going from Lockport to Pittsford. Smelling the roses (?) at the trail head in Holley. Tourist info center and yacht harbor at Brockport. The bikes in the rack can be borrowed for free. 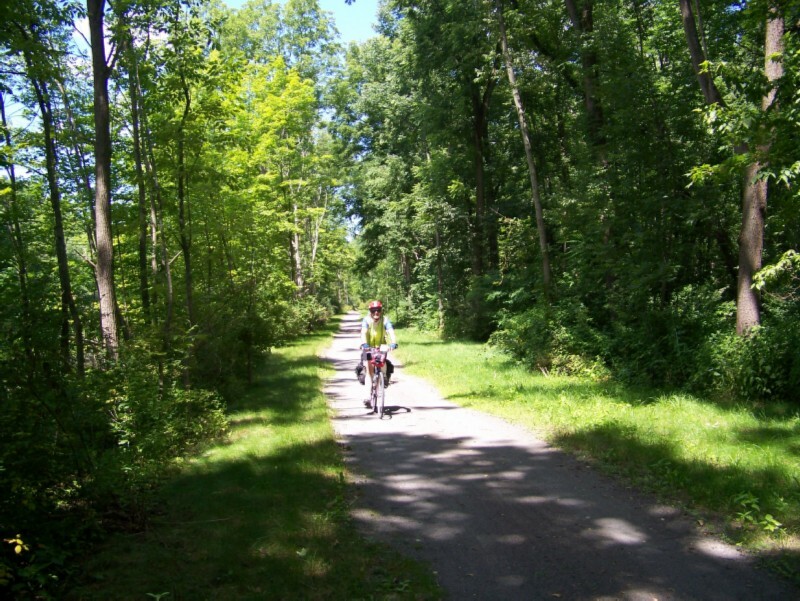 A view of the stone dust trail along the canal towpath near the Brockport trailhead. 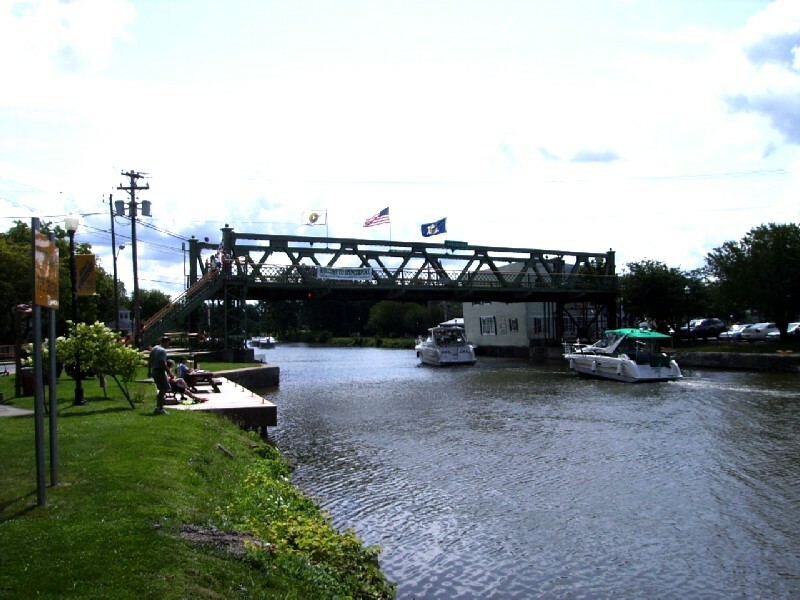 Lift bridge in Spencerport raised to let boaters pass. 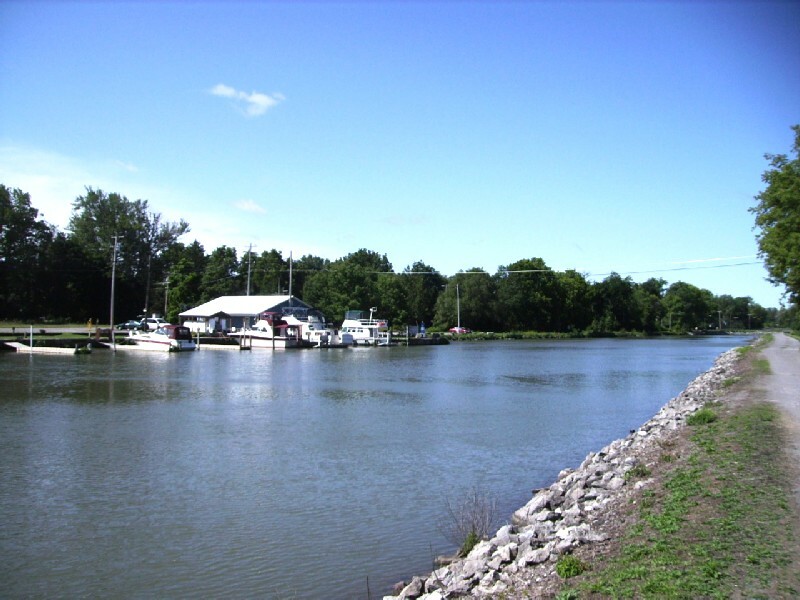 Pleasure boats were a frequent sight along the Erie Canal Heritage Trail segment. 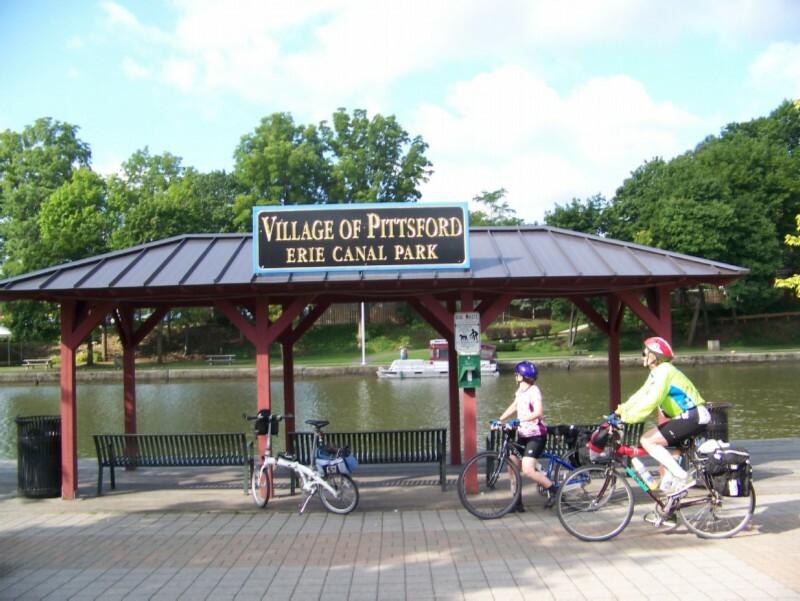 About 1.5-2 miles beyond the Greece Canal Park, the route doubles back vai a highway bridge over the canal to the south side; and the heavily wooded asphalt path through Rochester to Pittsford begins. 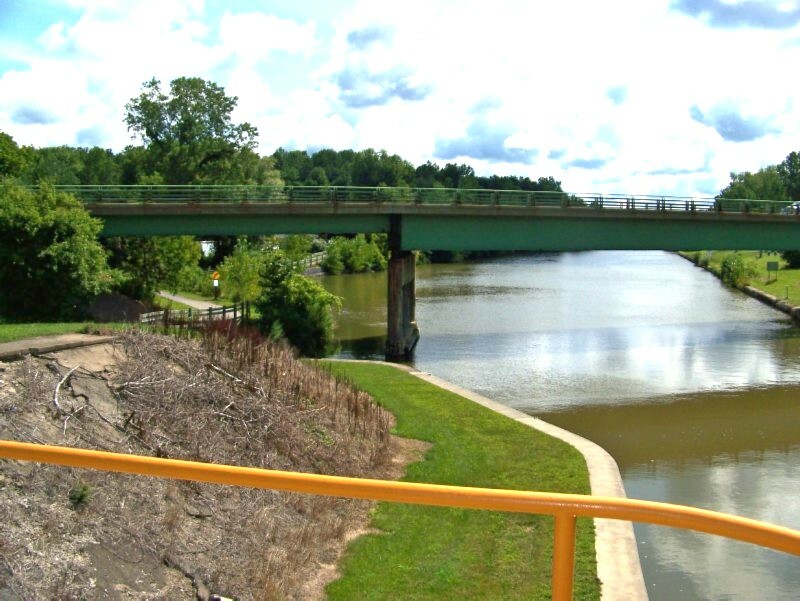 It follows the Barge Canal as it circles to the west and south of Rochester. 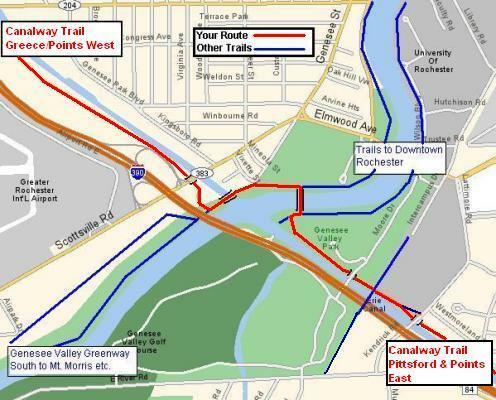 We navigated the tricky intersection of the Canal path and the Genesee Valley Green Way path to downtown Rochester with the help of this map (Sorry! I've forgotten the source) and signs. Our route follows the red line from the upper left to lower right in the map. 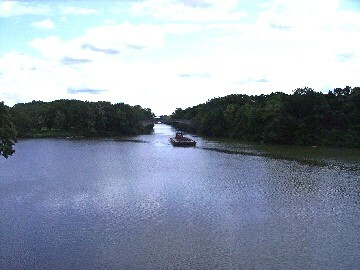 Barge in canal about to cross the Genesee River in Rochester, taken from a bridge across the canal. 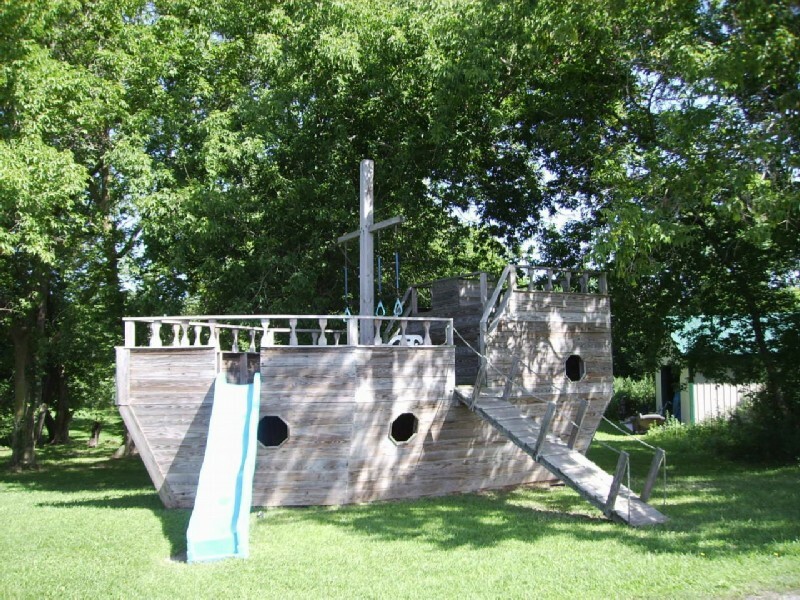 This was one of the few industrial barges we saw. The path is again on the north side of the canal. 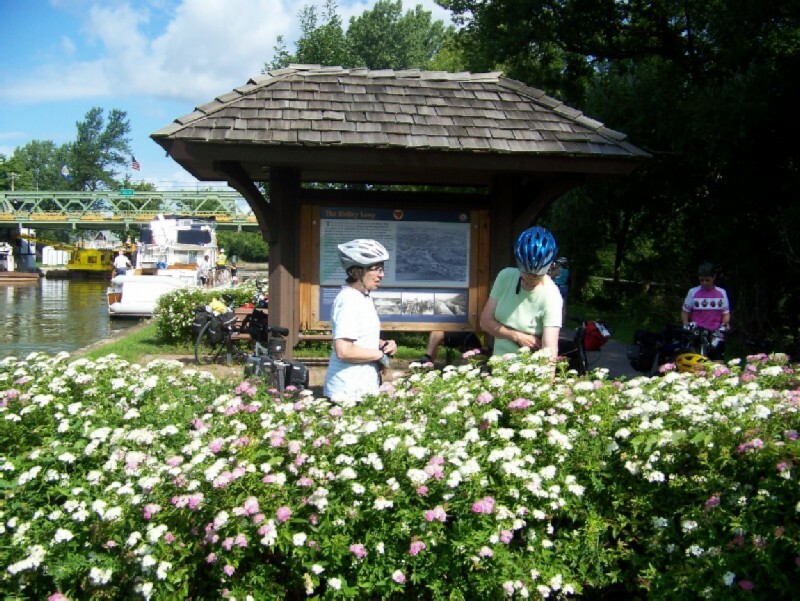 We exited to the left (North) onto Edgewood Avenue for the Towpath Motel at the first opportunity after passing under I390. 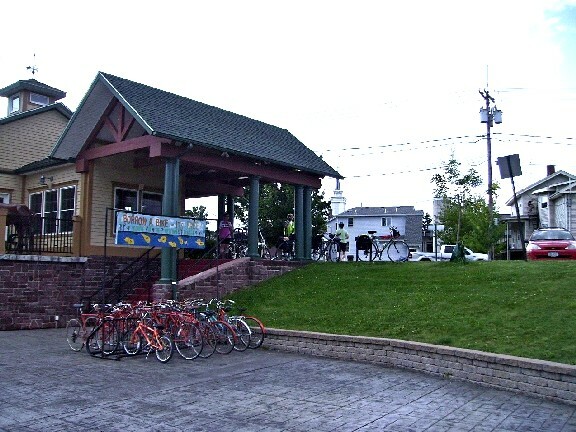 We rode for 1.7 miles to Monroe Avenue. The motel was a block to the left in a quiet residential area. 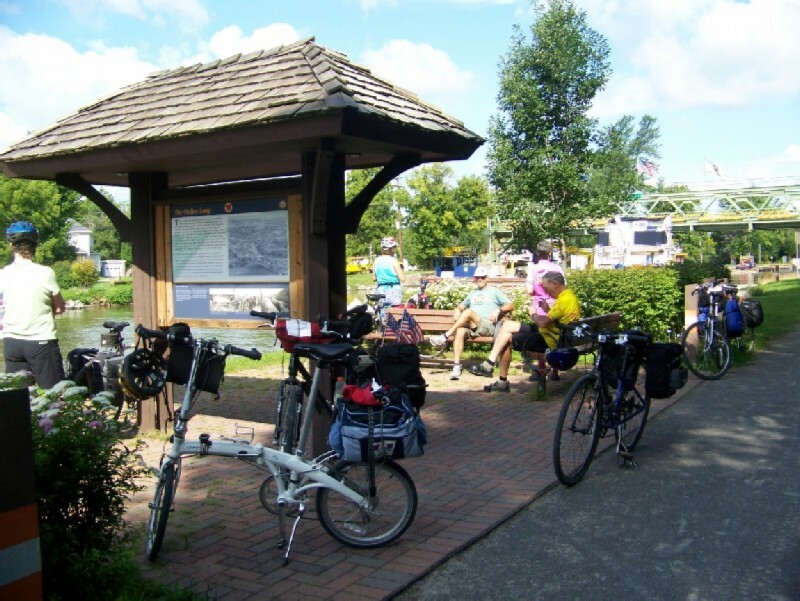 The Towpath Motel was OK; and all in all a pleasant way to overnight in Rochester. It was the first of only two motels that seemed to be filled up. I had expected "sprawl-land"; but the area was pleasantly green and residential. 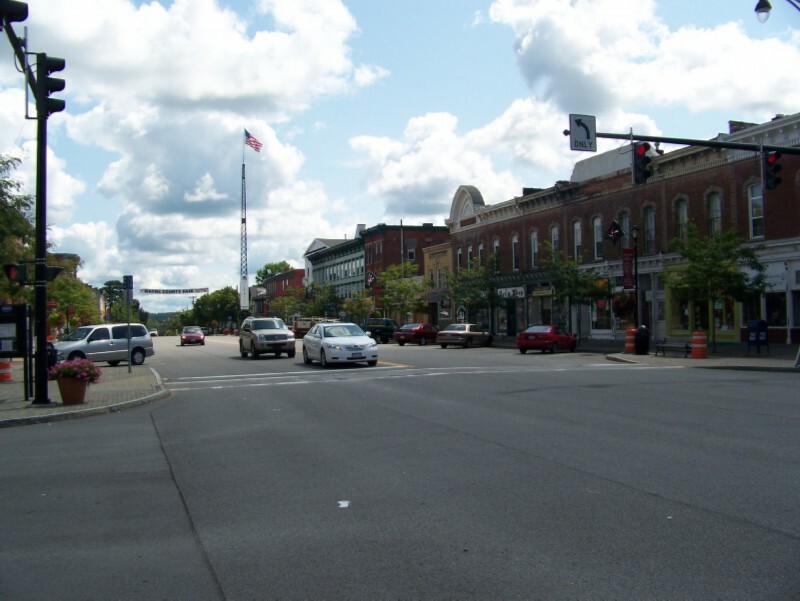 Less than a mile towards Rochester at the so-called Twelve Corners area there were shopping centers with several eating places. We headed southwest towards the canal. After 2.6 miles with the last bit being Walmart Country, we came to a long bridge. At the base of the bridge, there was a sign pointing to a canal maintenance office. 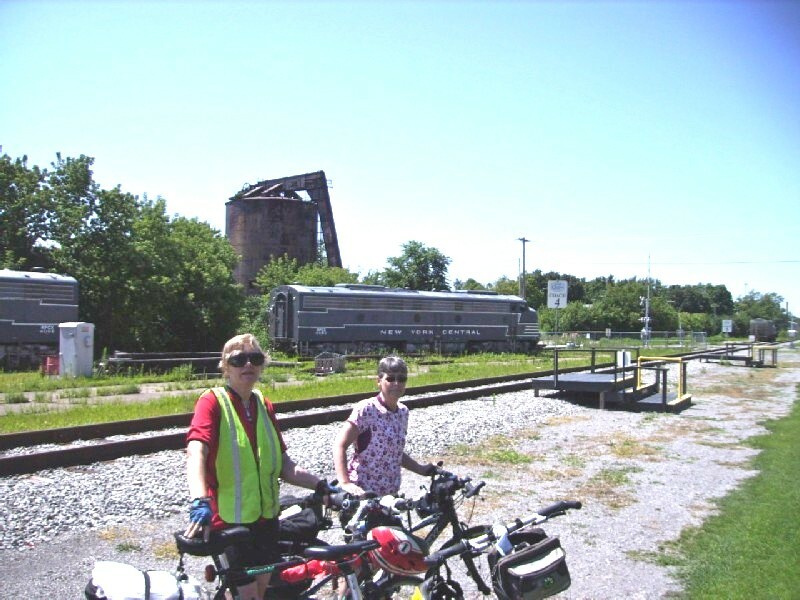 We decided to give it a try; and after a riding a block parallel to the bridge we saw a the official canal trail sign. A block later we found the trail. If there was a trail sign at the base of the bridge, I missed it. A rest garden near Pittsford provided by a local artist. 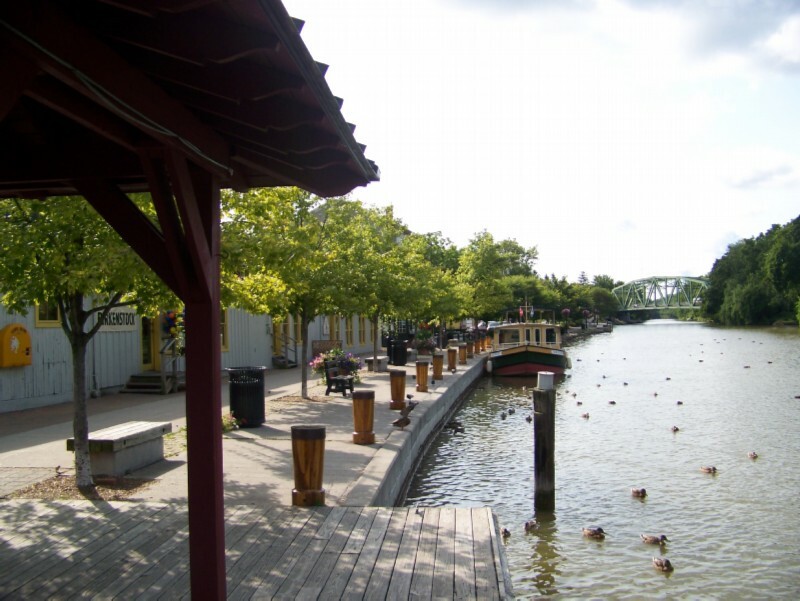 Fairport was the last of the yacht harbors, unless you count a decidedly down-scale settlement of water side homes and other buildings east of it. Along the Mississippi these would be called "camps". I missed it; but the rest of our party sighted a pay toilet up in a tree. About this time we passed two through riders going in the opposite direction. 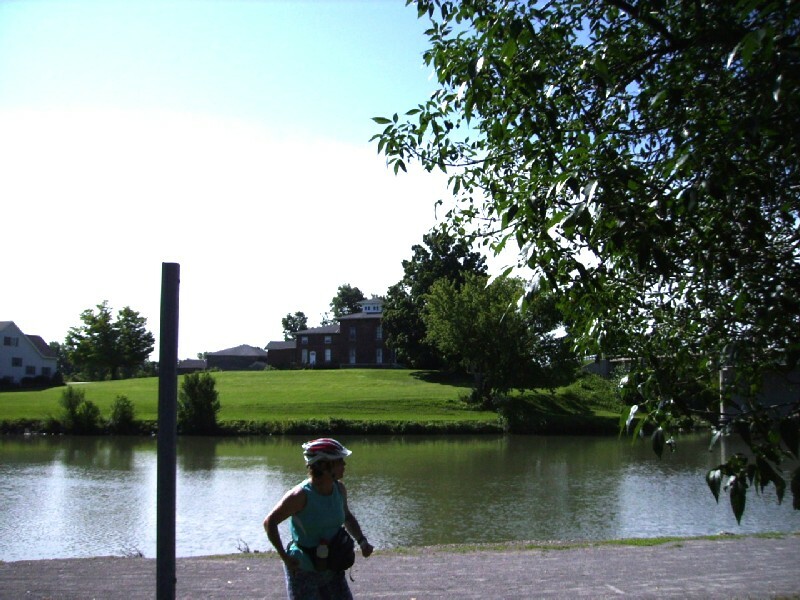 About 7 miles beyond Fairport, the trail crosses over to south side of the canal. 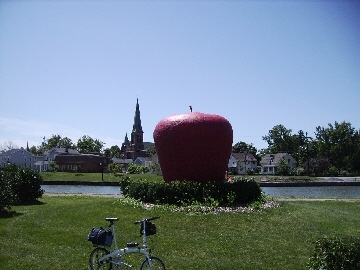 About 2 miles later at a park we followed what looked like a bike path that took us up to the main street of a town. 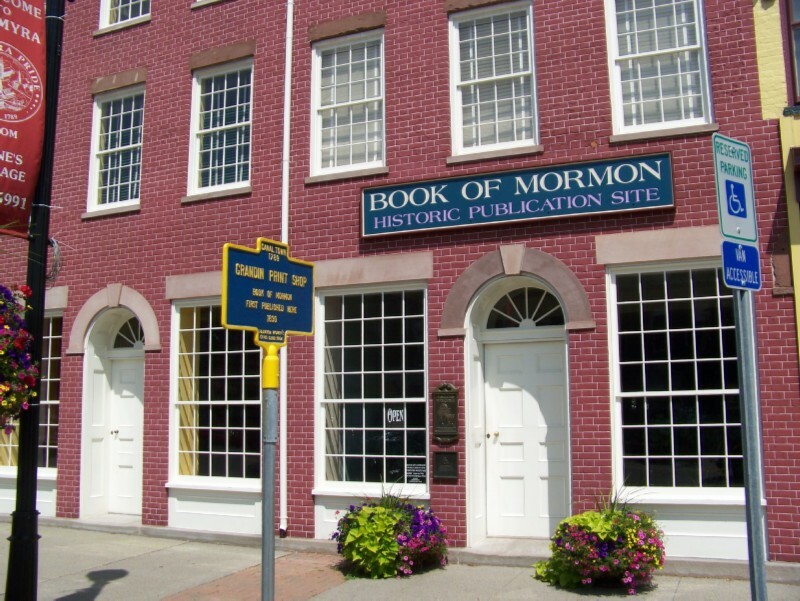 The first we knew that we had reached Palmyra was when I saw a Mormon historical sight. At that time I was still looking for Macedon. Looking at a map later, I realized we missed it when we crossed to the south side of the canal. Palmyra, the last of the more attractive small towns for a while. Grandin Print Shop in Palmyra. The hill can't be that steep! A section west of Newark was still under construction; and we had to dodge men at work. 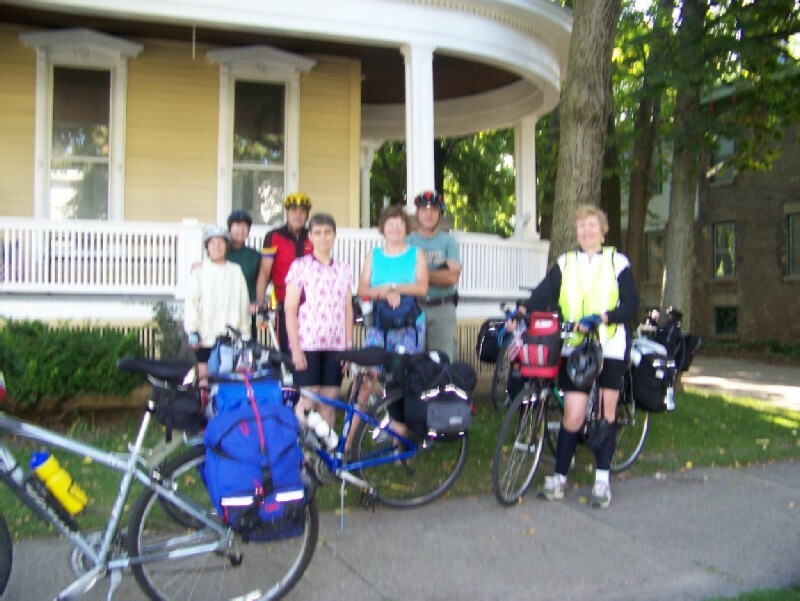 As we approached Main Street in Newark, the Quality Inn was along side the bike path. The motel was fine, other than the $108 rate, the highest of our tour, until about 10:30PM when a red neck rendezvous got underway in the pool area just outside our door..